First of all, congratulations for choosing to organize your business meeting or your future holiday in London, this extraordinary capital city. In order to turn these couple of days into an unforgettable experience, we would recommend you to choose only the best. For starters, if you want to travel in style, book the business class services of Heathrow Airport. You will fly comfortable and be close to a series of accessible means of airport transfers. The most important ones can be found at the end of this article, including the duration of the total journey. When it comes to accommodations, there is not a better place in London than Crowne Plaza London Docklands. Four stars, beautiful and accessible location, quiet atmosphere, modern facilities (flat TV screens, Internet, etc.) are just some of the things that you can enjoy while staying at this hotel. You will also be at a walking distance from important touristic and business attractions such as the O2 Arena, ExCel Exhibition Centre and Stratford City. For other districts, you can quickly hail a cab or use the nearby Docklands Light Railway station. In order to get a Heathrow to Crowne Plaza London Docklands Transfer by rail, you could take the train from Heathrow Terminal 1 (every 15 minutes) via Paddington H&C (every 10 minutes) and Tower Gateway DLR Station (every 10 minutes), finally enjoying a 5 minute walk. This journey might take about 1 hour and 10 minutes. The second option is to take the train from Heathrow Terminals 1-2-3 (every 5 minutes), then the Tube South Kensington Underground (every 5 minutes) via Tower Gateway DLR Station (every 10 minutes), and ending with a 5 minute walk. This journey lasts about 1 hour and 20 minutes. A Heathrow to Crowne Plaza London Docklands Transfer by car can be done by taking the M4 motorway. 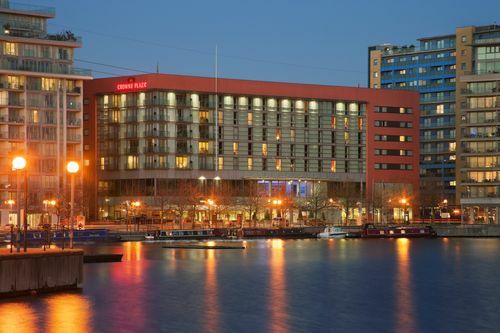 Heathrow Airport is at a 24.4 miles distance from Crowne Plaza London Docklands. This journey will take about 53 minutes, without including traffic. A Heathrow to Crowne Plaza London Docklands Taxi Transfer with 247 Heathrow Airport Transfer is going to take about 1 hour and 18 minutes, including rush hour traffic. The price for a Heathrow to Crowne Plaza London Docklands Taxi starts from 53 GBP.